3.and the yantra known as Sri Chakra. Srividya creates a systematic, esoteric discipline combining elements of the yogas of knowledge, of devotion, and of ritual. Sri Vidya is the knowledge of Sri, the Goddess, the knowledge that mattered or the real knowledge, that lead to liberation, or the path or teaching, that lead to the Supreme Truth. This intricate tradition guides the aspirant throughd the worship of several Gods and Goddesses to the central point which represents the Mother Goddess. The Sir Chakram or, in its elevated form the Maha Meru, is representative of this progression. 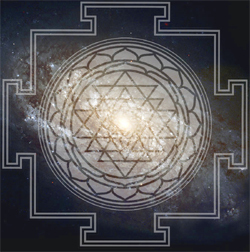 In the Sri Vidya tradition, the Sri Chakra is the yantra (diagrammatic symbol) for worship. When the Sri Chakra is elevated the Meru is formed. 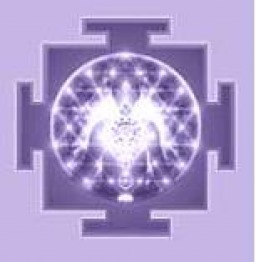 The Maha Meru is identical in structure to the Sri Chakra. 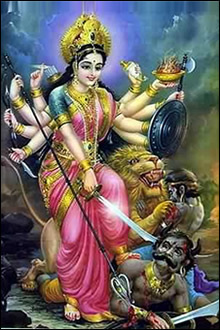 If the Meru is viewed from the top or is compressed it takes the shape of the Sri Chakra. The structure of the Sri Chakra is complicated. The Sri Chakra is made up a of series of nine triangles around the central point or Bindu. In the Sri Chakra, the journey is from the outer bhupura to the central Bindu, the path indicative of ones own journey to the ultimate God head, step by step. This form of ritualistic worship is called the Navavarana Pooja, avarana meaning veil. Indeed the process resembles the removal of the veil of ignorance stage by stage until the devotee merges with the Bindu or the Supreme Mother. 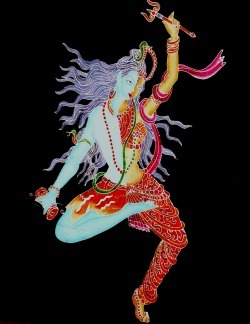 Each level or avarana is dedicated to a certain deity and offering worship, the aspirant is elevated to the next plane. Each level or Chakra has its own presiding deities and mudras. The tantra of Srichakra is called Srividya. This practical discipline holds that the individual contains within himself all the essential dimensions of the universe, that the entire universe unfolds itself in the development of the individual. 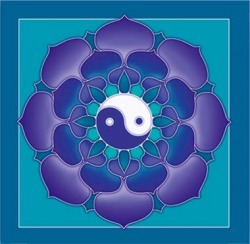 So tantra works with the human model of chakra organisation. The six centers in the human body, in groups of two, represent the centers of cosmic activity and consciousness whose presence activates the centers. The mooladhara and swadhisthana centers represent emanation, the manipoora and anahata represent preservation and the visudhha and ajna represent absorption. From the mooladhara to the visuddha are 10 principles (the five senses of smell, taste, form, sound and touch, and the five elements - earth, fire, water, air and space). The body centers are also grouped into three knots (granthis) and represented by Rudra at the swadhisthana, Vishnu at the anahata and Brahma at the ajna. The whole tantra practice is the effort to raise the energy lying in the mooladhara chakra towards the sahasrara chakra on the top of the head, through systematic meditation on all the chakras. The supine energy rises up like a serpent through the sushumna naadi, pierces through all the granthis and chakras, and unites with the topmost center, the 1000-petaled lotus, thus flooding and illuminating the body, mind and soul with bliss (brahmananda). This is the ultimate aim of human life. The Srichakra can be worshiped by external rites (bahir yaga) either at home or in public places like temples, etc, either for one's own benefit (svartha) or for the good of the Community (parartha). Though the prescribed ritualistic worship is elaborate and tedious, an individual is allowed to worship the same according to his abilities (yathashakti). The Srichakra can also be worshiped by 'inner sacrifice' (antar yaga), by means of articulations of the mantra and meditation on its symbolism. The Shodashakshari mantra, however, is revealed only to those who can surrender at the feet of a guru. Lastly, the body can be looked upon as the temple with the mother goddess installed in it, and worship offered only mentally (bhavana). Undertaking any ritual without being aware of the bigger picture is a futile exercise. It can be likened to the fate of a donkey which painstakingly bears a load of sandalwood without enjoying its fragrance. So an understanding of the significance behind traditional rituals is imperative for them to bear fruits. The Srichakra worship is an admirable conception of the universe within and without, which has stirred the Indian mind and facilitated spiritual progress in this ancient land of ours. Mantra, Yantra and Tantra form the three corners of the triangle of Sri-Vidya. Mantra is visualized in the Yantra. The worship of the Yantra, internal and external, and the practice of kundalini Yoga and other Sadhanas constitute the Tantra or modus operandi. The chief mantra of Sri-Vidya is Panca-dasaksari, and the chief tantra is the meditation of the identity of Mantra, Yantra and Tantra with the Devi Herself. If Sakti worship is done with understanding and appreciation and with love in the heart, then Mantra, Yantra, offerings, the procedure and paraphernalia of Puja are all transformed into forms and expressions of Cit-Sakti. The object is to effect the transformation of the materials and acts of ordinary experience into forms revealing the play, the power and the bliss of the Divine Mother. The Sundaryalahari says that if the worshipper practises Atmarpanam, ordinary talk is converted into Japa, normal work with the hand becomes Mudra, walking becomes Pradaksina, eating becomes Homa, Lying down Pranama-in fact whatever action is naturally done is transformed into worship. The Sri Vidya Upasaka should follow certain disciplines. He should not find fault with other paths or criticize them, while being steadfast in his own. The practice of Japa should go on as an under-current at all times. He should not ask for favours or accept them. He should do his duties in the world and the worship of the Deity without attachment to fruit. He should be fearless. He should not acquire wealth and possessions with the motive of selfish enjoyment and he should consider nothing as higher than realization of the Self. Sakti worship properly understood is a synthesis and harmony in which diverse and sometimes conflicting tendencies of human endeavour have been accommodated and each in union with the rest has been assured its fullest development and satisfation. An adept in Sri-Vidya can be a Sakta at heart, a Saivite in outlook and a Vaisnavite in practice. That such a reconciliation is not only possible by necessary was revealed to us in Sri Ramakrishna, the Avatara Purusa of the age. He has proved that all paths pursued with devotion lead to the one God, that Mantras are efficacious, that Yantras are potent, that Devatas and higher powers exist, that Siddhis do come and that step by step the Divine Mother leads the Sadhaka to higher and higher levels of perfection till he reaches the goal. Bhajante varnaste tava janani nam'avayavatham. This stanza gives indirectly the most holy Pancha dasakshari manthra which consists of three parts viz., ka-aa-ee-la-hrim at the end of Vagbhava koota, ha-sa-ka-ha-la-hrin at the end of kama raja koota and sa-ka-la-hrim at the end of Shakthi koota.These parts are respectively called Vahni kundalini, Surya Kundalini and Soma kundalini. The name śrīvidyā is also used to refer to a specific mantra used in this tradition having fifteen syllables. This mantra is called the pañcadaśī ("The Fifteen syllabled") and the pañcadaśākṣarī ("The Fifteen Syllables"). She is also worshipped with a mantra of sixteen syllables called the ṣodaśākṣarī by some people, which according to different published interpretations is obtained either by adding the syllable śrīṁ or the syllable śrī  to the fifteen-syllable mantra. Another published source says that the sixteenth syllable is kept secret and communicated only to adepts. It must also be noted that the ultimate mantra in the system is "Shodashi" having 32 syllables. Though all mantras are avainlable in -print they are useless for practice as they have to empowered by a competent teacher who will give life to it. But the underlying principle of the whole practice is to realise the ultimate unity of the Devata, the mantra, the teacher and the practitioner. See Parasurama Kalpasootra that is accepted by many of the practitioners as the base text. "Mantra devatA guru AtmAnAm aikyam". There are various schools of srividya. The left handed path; the right handed practice etc. ie. Vama, Dakshina, Samaya etc. Considerable controversy exists between the practitioners of each of the branches regarding superiority, though serious practitioners just follow their teaching without criticising other methodologies. This is a path that insists on equal respects for all paths in as much as Parashurama Kalpasootra injuncts "sarwa darshanaaninda" - "One shall not insult any other path". This is a cardinal principle that has run though Hinduism generally like a golden thread. The path, as does Hinduism, believes all paths lead to the ultimate reality. This path also emphasises the value of visualisation by stating that "Bhaavanaadhaardyaat nigrahaanugraha sheshi" "One gets the power to bless or curse based on his/her visualisation ability".